Recently, I was looking for a place to go for a long weekend, and asked friends around the globe where to go. 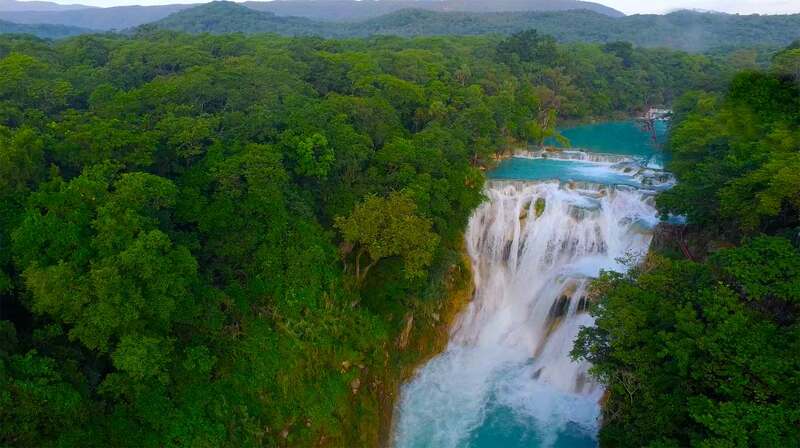 Some friends whom I met in Mexico while attending a wedding in Guanajuato (perhaps the most beautiful colonial city I’ve ever visited) mentioned that I visited a region of central Mexico called Huasteca Potosina. 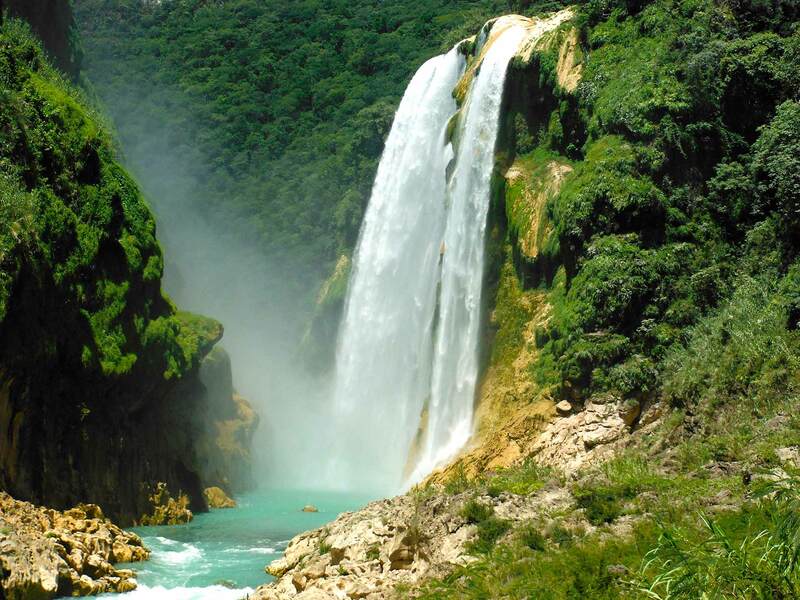 La Huasteca refers to a group of indigenous people that live in that area of Mexico and have been for centuries; Potosina simply refers that it is in the state of San Luis Potosi. The idea piqued my curiosity, as there is no information about this region in Lonely Planet and only some sparse discussion on some internet forums. I was sent this video, and after watching this, I was hooked in. I soon looked for tour operators and with my snap research it appeared that Huaxteca.com was the most reliable tour operator in the area. 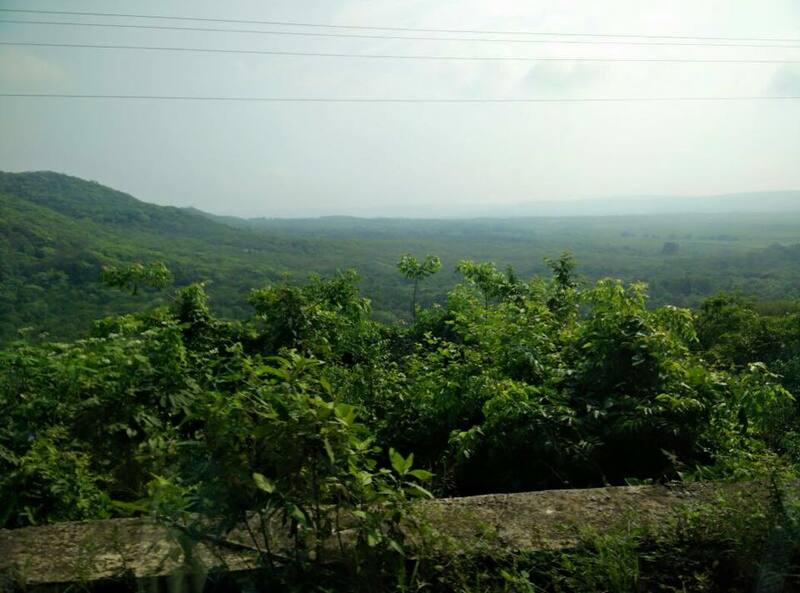 I contacted the owner via Whatsapp and arranged a three day two night tour. The price, which included lunch and hotel, was stunningly cheap. I found a friend who was willing to take the trip and off we went. We flew into the city of San Luis Potosi, which is four hours to the west of the base of the tour, Ciudad Valles. Tampico is actually about half the distance from Valles, but the safety situation in that city is highly unstable. There is only one flight a day from Houston to San Luis, so we arrived around 9 PM from Houston on United Airlines, caught a taxi to a hotel next to the bus station, Hotel Sands, bought our bus tickets for 4:20 AM, and caught a few hours of sleep before waking up and taking a four hour journey on a Mexican bus called Vencedor to Ciudad Valles. 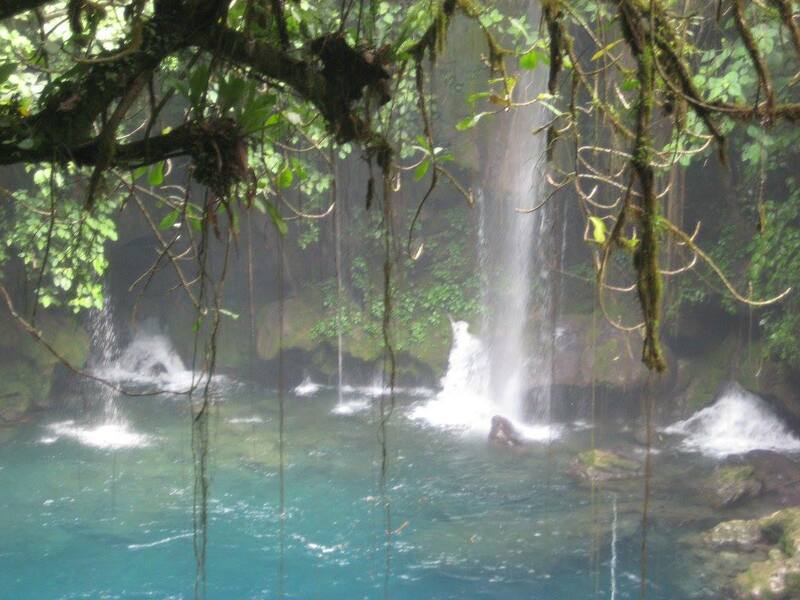 Upon arrival, our hotel, Sierra Huasteca, was a short walk from the bus station. This was formerly a Country Inn, but workers at the front told us that the franchising cost was too much so the agreement was squashed. We only had a few minutes before the tour bus picked us up for our activities, and boy were we blown away. 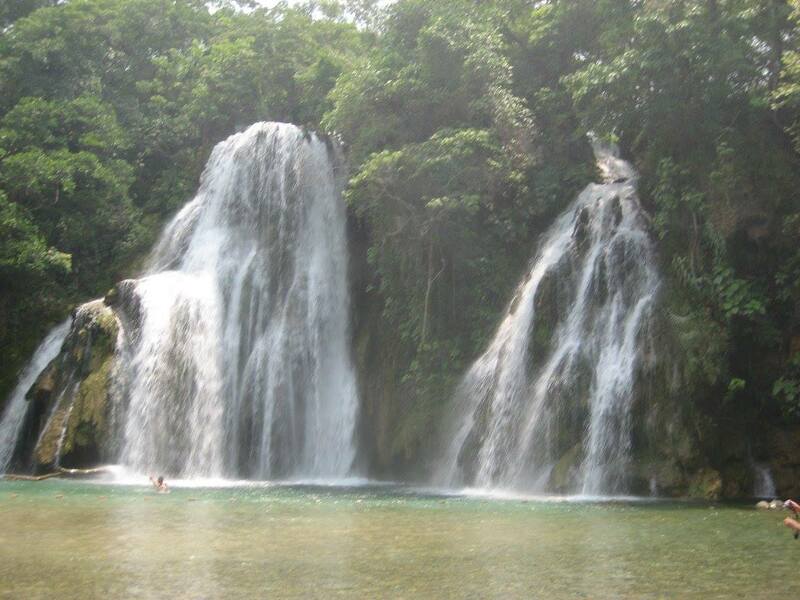 We were taken to some waterfalls named Micos, where we were asked to jump. That’s right, jump off waterfalls. Tip: bring aqua shoes with good traction because the rocks are extremely slippery. We jumped off eight waterfalls, ranging from four to ten meters. This was exhilarating. After that, we thought we were done, but no, we were taken for an even more interesting activity: rappelling. 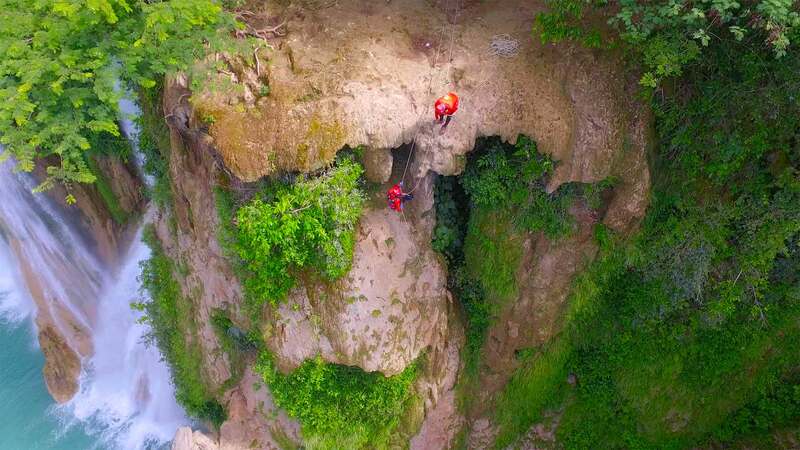 Not just any rappelling, but rappelling off a fifty-five meter cliff. The idea of it is frightening, but actually once you make your way down, it’s not so bad. This was the final activity of the day, after which we were taken to a local village where we were served a homemade meal. The second day was a bit more calm, as the body has only so much adrenaline. 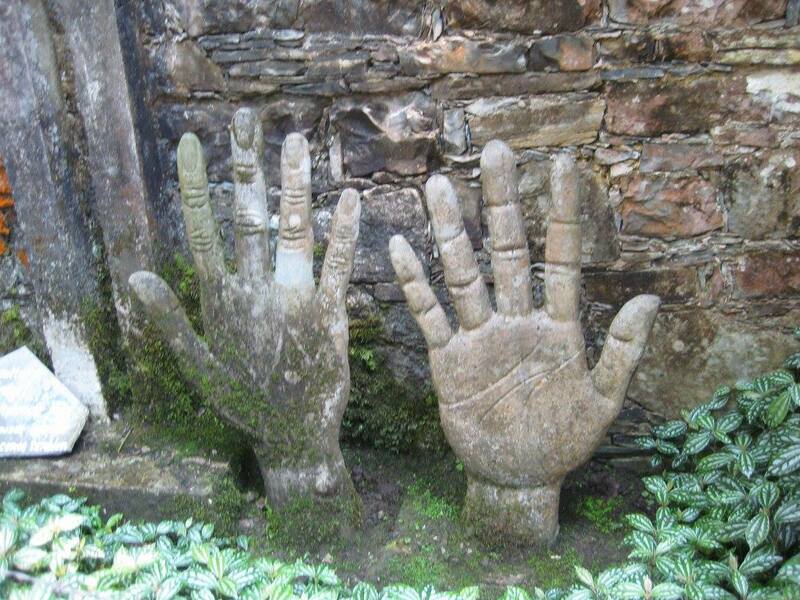 The tour was to a city called Xilitla, where the son of a British royal named Sir Edward James built an artistic gem in the middle of a forest. It is bizarre and fascinating, and a nice change of pace after the previous day. After a few hours there we were fed another excellent meal, enchiladas huastecas, basically the best green enchiladas you will eat in your life. After this, we were taken to a place called The Abyss, a deep gorge where birds dive down and at the last instant fly back up. A surreal experience to say the least. The best was saved for last as we were taken to a city called Tamasopo, to a destination called Puente de Dios, essentially an intersection of waterfalls and crystal clear water. Here, most chose to swim while lunatics such as myself chose to jump off a ten meter cliff. After a few hours here, we were fed grilled plantains, fresh sugar cane, and another local meal. From Tamasopo, we caught a bus to San Luis Potosi. What we learned is that there are two types of buses in Mexico, express and regional. Whereas our original bus was express, taking the toll road, this was a regional bus, and actually seemed more like a commuter bus, as it picked up anyone and everyone off the side of the road, and also dropped them off wherever they liked, at times simply on the side of a mountain. What was supposed to be a three hour journey took five hours, and along the way we survived a thunderstorm from hell (which didn’t seem to phase the driver at all). Still, it was a fascinating experience to see how people from the area lived day to day. 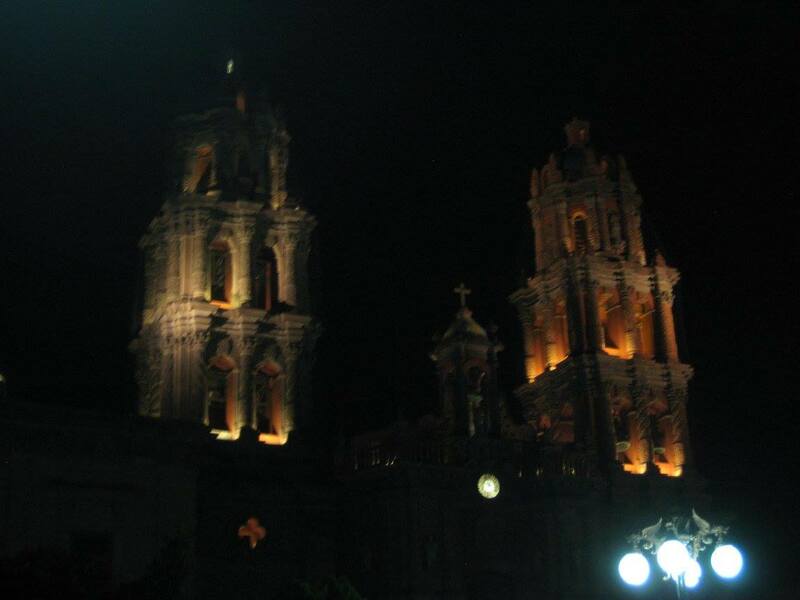 By the time we arrived in San Luis Potosi, it was already late, but still even at night the center of the city is a glorious collection of colonial architecture. There were still families walking around and couples smooching. The vacation finished off with a meal of enchiladas potosinsas, fried tortillas with cheese inside, and a walk around the centro. The hotel for this night was the excellent Hotel Panorama, a modern hotel at a wonderfully low price. In the morning, we caught a taxi back to the hotel for a 7 AM flight back to Houston. At the time, I didn’t appreciate how great this vacation was, but with the passage of time, I have to say this was the most interesting and possibly most satisfying vacation that I have taken in my life. Now the plan is just to see when this trip can be made again. 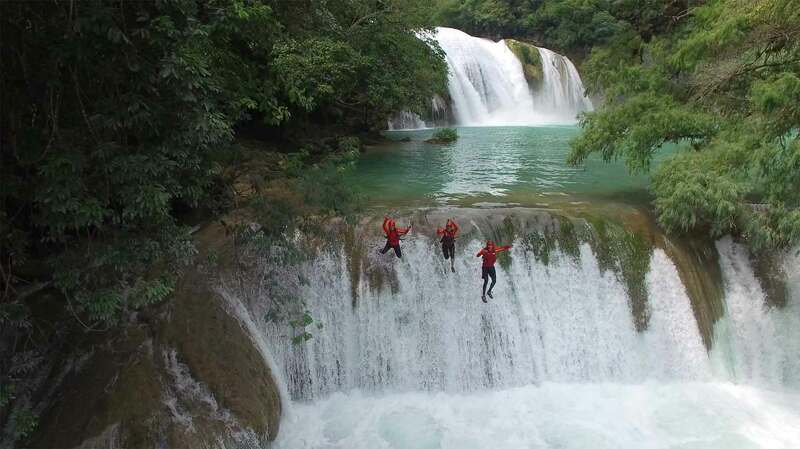 As of now, outside of Mexico, this eco and adventure tourism destination is basically unknown, and thus still a bargain (in fact, the agency stated we were the first English speaking tourists they had serviced). But as time goes by, the word will get out, and it will become the new hip place to go like Costa Rica, so enjoy while it’s unknown and a bargain destination!